Even as drug costs remain sky-high enough to anger American patients, several recent developments suggest that key stakeholders may finally be getting the message to do something about them, or at least look like they’re doing something. The most recent such development (at deadline) came March 6, when UnitedHealthcare announced it will expand pharmacy discounts to more than 7 million people enrolled in its insured commercial group benefit plans. When the policy is implemented starting next year, the insurer says, consumers will see lower out-of-pocket costs as the insurer shares with them savings from pharmacy manufacturer rebates at the time of purchase. UnitedHealthcare’s announcement brought the insurer praise from Health and Human Services Secretary Alex Azar. A week earlier, he highlighted proposals to lower drug prices that were contained in both a white paper by the presidential Council of Economic Advisers and included in the $4.4 trillion budget proposed by President Donald Trump for the 2019 federal fiscal year, which starts October 1. One proposal would require insurers and pharmacy benefit managers to share with Part D Medicaid enrollees more of the discounts they receive from drug manufacturers and would allow insurers to cover just one drug per category instead of two. Other proposals would allow up to five states to determine what drugs could be covered, cap out-of-pocket spending for Medicare enrollees, and accelerate development of generic drugs. 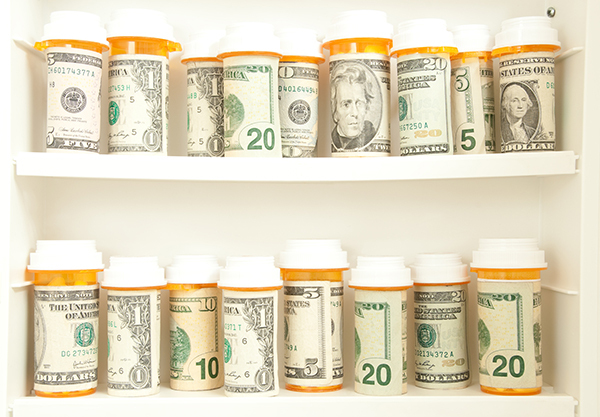 Drug spending in the U.S. is projected to reach $590 billion by 2020, up from $337 billion in 2015, according to insurance industry group America’s Health Insurance Programs (AHIP). Increased sharing of discounts and other actions aimed at lowering prices will reduce profits for Biopharmas, as well as shrink how much they ultimately generate in sales from their therapies. Below is GEN’s updated top 15 list of top-selling prescription drugs. The top-selling drug on last year’s list was the same one that topped GEN’s first list of best-selling drugs in 2013, when it generated $10.659 billion—which means that its sales have nearly doubled, rocketing almost 73%, in the past five years. Nine of last year’s 15 top-selling drugs saw year-over-year sales gains, with five of the nine registering double-digit increases (and a sixth coming close at 9.4%). The rest of the list saw sales declines since 2016, most often reflecting the launch of generic competitors or insurer discounts. Two drugs are new to the best-seller list this year: The Bristol-Myers Squibb (BMS)/Pfizer anticoagulant Eliquis® (apixaban) could be ranked for 2017 since unlike the previous year, Pfizer included Eliquis-specific figures in its fourth-quarter results. BMS has another newcomer to the list, the cancer immunotherapy Opdivo® (nivollumab), which outsold its rival Keytruda® (pembrolizumab)—though the Merck & Co. immuno-oncology treatment could appear in future years since it finished No. 21 with $3.809 billion, more than double its 2016 sales (171.6%). Just shy of the top 15, ranking #20 through #16, are treatments that all generated between $3.9 billion and $4.4 billion last year—Novo Nordisk’s Victoza® (liraglutide), Johnson & Johnson’s Stelara® (ustekinumab), Biogen’s Tecfidera® (dimethyl fumarate), GlaxoSmithKline’s Advair® / Seretide® (fluticasone and salmeterol), and Gilead Sciences’ Harvoni® (ledipasvir 90 mg/sofosbuvir 400 mg). Among top disease categories, cancer remains on top with six of the 15 top sellers—including three of the top five. Arthritis accounts for four of the top 15, all within the top half of the list, while Crohn’s disease is included among indications for two of the top sellers, and diabetes, just one. Unlike recent years, none of the top 15 drugs are indicated for hepatitis, with Harvoni missing the top 15 following discounts to insurers. Top-selling drugs are ranked based on sales or revenue reported for 2017 by biopharma companies in press announcements, annual reports, investor materials, and/or conference calls. Each drug is listed by name, sponsor(s), diseases indicated, 2017 sales, 2016 sales, and the percentage change between both years. Sponsor(s): Johnson & Johnson and Merck & Co. Indication(s): Multiple myeloma, in combination with dexamethasone; multiple myeloma, as a maintenance therapy following autologous hematopoietic stem cell transplantation; transfusion-dependent anemia due to low- or intermediate-1-risk myelodysplastic syndromes associated with a deletion 5q abnormality with or without additional cytogenetic abnormalities; mantle cell lymphoma in patients whose disease has relapsed or progressed after two prior therapies, one of which included bortezomib. Indication(s): Moderate to severely active rheumatoid arthritis (RA); moderate to severely active polyarticular juvenile idiopathic arthritis; active psoriatic arthritis in adults; active ankylosing spondylitis in adults; moderate to severely active Crohn’s disease in adults who have had an inadequate response to conventional therapy; moderate to severely active pediatric Crohn’s disease who have had an inadequate response to corticosteroids or immunomodulators such as azathioprine, 6-mercaptopurine, or methotrexate; moderate to severely active ulcerative colitis in adults who have had an inadequate response to immunosuppressants such as corticosteroids, azathioprine or 6-mercaptopurine (6-MP); moderate to severe chronic plaque psoriasis in adults who are candidates for systemic therapy or phototherapy; moderate to severe hidradenitis suppurativa; non-infectious intermediate, posterior panuveitis in adults. 1 Effective January 1, 2014, Amgen acquired rights to pegfilgrastim from Roche. Roche had held those rights under license from Kirin-Amgen (a joint venture between Amgen and Kirin Holdings, of Japan), in Eastern Europe, Latin America, Asia, the Middle East, and Africa since 1989. See Amgen announcement of October 22, 2013. 2 Kyowa Hakko Kirin retains rights to pegfilgrastim under the names G-Lasta® in Japan, Peglasta® in Singapore and Thailand, and Neulasta® in Taiwan. Figures for Kyowa Hakko Kirin combine sales of G-Lasta ($0.170 billion [¥18.1 billion] in 2017; $0.146 billion [¥15.5 billion] in 2016) with sales of Neulasta/Peglasta ($0.019 billion [¥2.0 billion in 2017; $0.014 billion [¥1.5 billion] in 2016). 3 Pfizer lists separately the Lyrica revenues generated in all of Europe, Russia, Turkey, Israel, and Central Asia countries ($553 million in 2017, $801 million in 2016). Those revenues are listed by Pfizer’s “Essential Health” operating segment, while its “Innovative Health” segment records Lyrica revenues generated elsewhere in the world, including the U.S. ($4.511 billion in 2017, $4.165 billion in 2016). 5 Pfizer markets Enbrel outside the U.S. and Canada, where the treatment is marketed by Amgen.